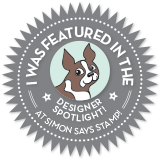 While out in Iowa over Memorial Day weekend my mom was showing me some fun things you could do with stamps and infusions. Needless to say the Penny Black flower came out awesomely, and she made a couple of them since you can do it a few times before the infusions are all used up. I asked if I could take one home, and it was decided that we would each take one and make a card for the other person with it. I ended up not getting mine done until after my birthday in June, so I took the opportunity to try and use a variety of things that I had gotten for my birthday from my mom. So, the bottom layer is just ordinary card stock. The next layer I used the new harlequin stencil I got with the orange wink a stella pen that I got. The next layer I started with one of the pieces of paper that the stencil was wrapped in, and used some of the infusions that I got for my birthday with clear shimmer paint brush strokes. Then I added the flower that I was supposed to be using, added some more of the harlequin pattern, this time with paste through the stencil. Then I used one of the Tim Holtz metal embellishments, and used one of his distress crayons to lightly color over it, to fill in the words with white so it was more readable (these were the only other things I used that weren't part of my birthday package). I really enjoyed doing this card and was happy with how it turned out.